The Reserve Bank of India (RBI), is India’s central banking institution, which controls the issuance and supply of the Indian rupee. Until the Monetary Policy Committee was established in 2016, it also controlled monetary policy in India. It commenced its operations on 1 April 1935 in accordance with the Reserve Bank of India Act, 1934. The original share capital was divided into shares of 100 each fully paid, which were initially owned entirely by private shareholders. Following India’s independence on 15 August 1947, the RBI was nationalized on 1 January 1949. The article RBI – Functions presents the information about RBI and it’s functions. RBI is the central bank of India. It is also known as the Banker’s Bank. The origins of RBI can be traced to 1926 when the Royal Commission on Indian Currency and Finance –also known as the Hilton-Young Commission –recommended the creation of a central bank for India to separate the control of currency and credit from the Government and to augment banking facilities throughout the country. RBI Act of 1934 established the Reserve Bank and it started its operations in 1935. Starting as a private shareholders’ bank, the Reserve Bank was nationalized in 1949. It aimed at achieving coordination between the policies of the government and those of the central bank. 1926: The Royal Commission on Indian Currency and Finance recommended creation of a central bank for India. 1927: A bill to give effect to the above recommendation was introduced in the Legislative Assembly, but was later withdrawn due to lack of agreement among various sections of people. 1933: The White Paper on Indian Constitutional Reforms recommended the creation of a Reserve Bank . A fresh bill was introduced in the Legislative Assembly. 1935: The Reserve Bank commenced operations as India’s central bank on April 1 as a private shareholders’ bank with a paid up capital of rupees five crore (rupees fifty million). 1942: The Reserve Bank ceased to be the currency issuing authority of Burma (now Myanmar). 1947: The Reserve Bank stopped acting as banker to the Government of Burma. 1948: The Reserve Bank stopped rendering central banking services to Pakistan. 1949: The Government of India nationalised the Reserve Bank under the Reserve Bank (Transfer of Public Ownership) Act, 1948 . The Central Board of Directors is at the top of the Reserve Bank’s organisational structure. These are appointed by the Government under the provisions of the Reserve Bank of India Act, 1934. The Governor is the Reserve Bank’s chief executive. It supervises and directs the affairs and business of the RBI. The management team also includes Deputy Governors and Executive Directors. The Central Government nominates fourteen Directors on the Central Board, including one Director each from the four Local Boards. The other ten Directors represent different sectors of the economy. All these appointments are made for a period of four years. Govt. also nominates one Government official as a Director representing the Government, who is usually the Finance Secretary to the Government of India and remains on the Board ‘during the pleasure of the Central Government’. The Reserve Bank Governor and a maximum of four Deputy Governors are also ex officio Directors on the Central Board. With a view to integrating the functions of deposit insurance and credit guarantee, the Deposit Insurance Corporation and Credit Guarantee Corporation of India were merged and the present Deposit Insurance and Credit Guarantee Corporation (DICGC) came into existence on July 15, 1978. It was established under the DICGC Act 196. It ensures all deposits (such as savings, fixed, current, and recurring deposits) with eligible banks except some deposits that we will study in the chapter related to DICGC. RBI established BRBNMPL in February 1995 as a wholly-owned subsidiary to augment the production of bank notes in India and to enable bridging of the gap between supply and demand for bank notes in the country. It has been registered as a Public Limited Company under the Companies Act, 1956 with its Registered and Corporate Office situated at Bengaluru. NHB was set up on July 9, 1988 under the National HousingBank Act, 1987 as a wholly-owned subsidiary of the Reserve Bank to act as an apex level institution for housing. Also, RBI performs a wide range of promotional functions to support national objectives. 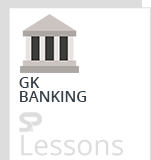 Objective: Banker to the Government: performs merchant banking function for the central and the state governments; also acts as their banker. RBI performs the function of Financial supervision under the guidance of the Board for Financial Supervision (BFS). This was constituted in November 1994 as a committee of the Central Board of Directors of the Reserve Bank of India. The objective is to undertake consolidated supervision of the financial sector comprising commercial banks, financial institutions, and non-banking finance companies. The Board is constituted by co-opting four Directors from the Central Board as members for a term of two years and is chaired by the Governor. It has 27 regional offices, most of them in state capitals and 04 Sub-offices. It has five training establishments. Two, namely, College of Agricultural Banking and Reserve Bank of India Staff College are part of the Reserve Bank. Others are autonomous, such as National Institute for Bank Management, Indira Gandhi Institute for Development Research (IGIDR), Institute for Development and Research in Banking Technology (IDRBT) etc.